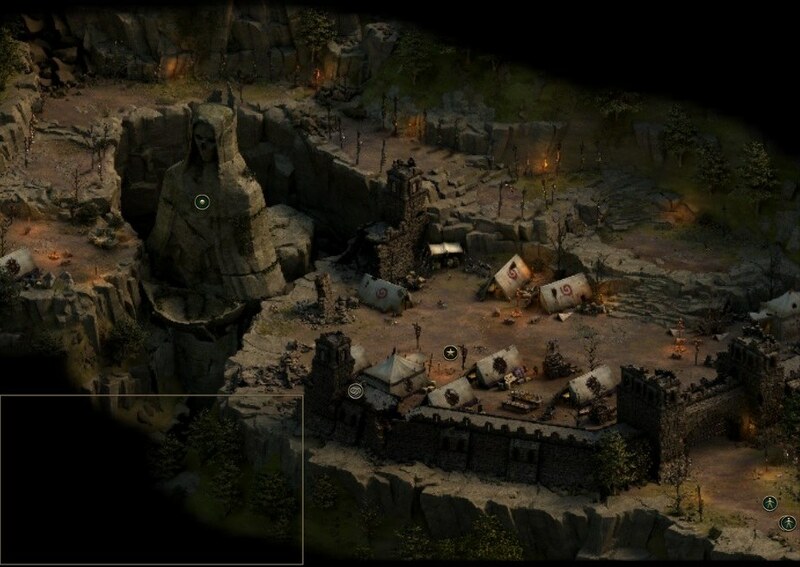 Edgering Ruins is an location in Tyranny. This is the first map of the game. It begins with you standing next to Aurora as the mountain path collapses behind you, whom you speak with before being attacked by a member of the Vendrien Guard. After defeating him, you will need to head right and interact with the boulder here. If you have 30 Athletics you can move the boulder, and crush one of the enemies, if not, your only choice will be to squeeze through. Note: If you head back to the beginning and go left and down there is a rope you can climb down if you have sufficient Athletics and a Lore and Subterfuge check for some xp and loot. Among the loot is a Battle-Worn Torc. Immediately after the boulder you will need to help the Disfavored defeat the Vendrien Guard here. Just past them you will come upon your first companion, Verse. You can assist her in defeating the enemies here. After they are defeated, you can gain loyalty with her by agreeing to loot the corpses of the fallen. Heading down, you run into Tarkis Demos and four Vendrien Guard soldiers, sparking an immediate conversation with favor or wrath effects based on your choices in the Conquest. You will have no choice but to assist Mocking Blaze and the Scarlet Chorus in defeating the Vendrien Guard here, though you take Tarkis Demos alive. Immediately after the battle a Disfavored Crescent Runner will come running in from the left and beckon you to hurry to the cliff. Feel free to loot the Vendrien Guard corpse you find along the way. At the cliff you will find Pelox Tyrel holding a Disfavored officer named Drastus hostage. There is an Athletics (30) check here that allows you to save Drastus and gain favor from both the Scarlet Chorus and the Disfavored. If you chose to negotiate peace while in Apex during Conquest, you may also convince him to let Drastus live. Alternatively you can attack, but you will gain wrath with the Scarlet Chorus if you save him and favor with Disfavored, or vice versa if you let him die. Looting Pelox will net you a nice Bangle. After the battle there is a rope you can climb if you have 35 in Athletics that leads to an Invisibilty Potion (you can use Verse). You can speak to Mocking Blaze in the middle of the camp and decide Pelox's fate. If you spare him you will gain favor with the Scarlet Chorus and wrath with the Disfavored, or vice versa if you choose to execute him. Kosma will now be available to purchase equipment from as well. When you are finished, head to the bottom right of the camp area and pass through the gate there. Immediately beside the gate, you will find Pelox Tyrel strung up on a pole if you chose to execute him earlier. You can choose to grant him a quick death or simply leave him be, though there are no consequences either way. To the left, heading along the rocks, there is a rope upwards requiring an Athletics (35) check, which you can again use Verse to pass, granting you access to a chest with a Subterfuge (39) check containing the scroll: Sigil of Proximate Action. Lastly, double back to the bottom right and exit the map.